The Castle Storage in upstate New York where John's lock-up is located. Castle Storage is a 24 hour self storage facility company. It has a distinctive logo of a castle. John's Lock-up is located at 42 Rover Hill outside Buffalo, New York. A call comes to John's cell phone, which Dean has kept charged. The caller informs them that there has been break-in at a storage locker belonging to "Edgar Cayce." Sam and Dean investigate, and find the storage area guarded against demons with a devil's trap, and a trip wire which fires a rifle propped up on a warthog's skull. Someone has broken in and been hit by the shotgun; blood is on the floor. They realize that John Winchester kept this storage unit, where he stored weapons, supernatural objects, research, and personal mementos, as well as a weapons cache which included landmines. The brothers also find mementos from their childhood, as well as a collection of curse boxes, built by Bobby, with one missing. Zachariah lures Dean and Sam to the lock-up by implanting a fake vision in Chuck's head. Chuck then sends one of his fans, Becky Rosen, out to tell Sam and Dean about his vision, that the "angels have lost the Michael Sword" and that it is to be found "in a castle, on a hill made of 42 dogs." Dean recognizes this as a reference to the lock-up, located at Castle Storage, 42 Rover Hill. The brothers make their way there, and find dead demons and Zachariah inside. The angel tries to torture and coerce Dean into becoming the Michael's vessel, his "sword," but Castiel intervenes. 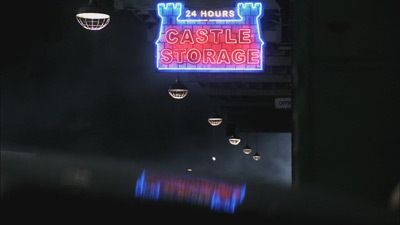 As Sam, trapped in his mind, runs from the police, we see Castle Storage, which was the location of John's lock-up. Crowley tries to contact Abaddon, who answers the 'call' outside a Castle Storage building. Looking for information on the First Blade, Dean and Crowley visit John's lock-up at Castle Storage, where they find information on the case John worked on with another hunter named Tara, which is how he learned about the Blade's existence. Looking for Linda Tran and following a clue from the ghost Candy, Sam and Dean travel to a Castle Storage in Wichita, Kansas, where they find Linda. However, one of the workers, Del, turns out to be a demon and he traps Sam and captures Dean. Sam and Linda break free and Del is captured. After Linda kills Del with Ruby's Knife, the three leave Castle Storage for the Bunker. A Castle Storage facility is seen near Main Street in Lebanon, Kansas.